Senior Directors from the Technical Union of the Automobile, Motorcycle & Cycle Center for Testing and Applied Research for Mobility (UTAC CERAM) have presented Prof. Dr Ralf Speth with an International Automotive Task Force (IATF):16949 Quality Management certificate, the first of its kind within the UK’s automotive industry. IATF 16949 is one of the automotive industry’s most widely used international standards for quality management. The JLR Quality Management System – QMS (a collection of business processes focused on consistently meeting customer requirements and enhancing their satisfaction. It is aligned with JLR’s organisation's purpose and strategic direction) has been certified to ISO 9001 and TS 16949 since 2002. Compliance to these international standards ensure that our QMS is world class capable of meeting and exceeding our customer requirement. JLR Compliance to the above standards also underpins our homologation requirements enabling us to sell our products globally. The new IATF 16949 & ISO 9001 standards were launched during 2016 for compliance. JLR’s Company Quality department (CQ) reacted to this change and successfully launched the IATF 16949 QMS upgrade project. JLR successfully passed all the UTAC audits during weeks 34 ~36 across its UK manufacturing and engineering facilities. 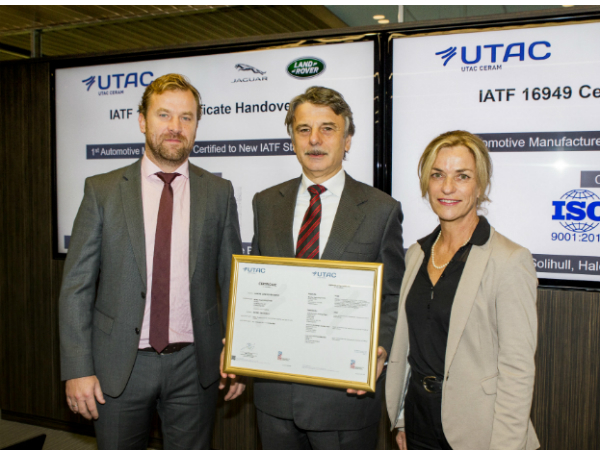 Certification to IATF 16949 is another landmark for JLR, who are the only Automotive Manufacturer in the world currently to be certified to the new and modified IATF16949:2016 & ISO 9001:2015.